I was born in 1967, and can only agree. I don’t think it’s possible to explain why it is I love wandering the hills with a rucksack and tent on my back, or why it makes me feel so utterly at peace and content. It just does. And I guess if you’re here reading this blog then you probably know what I’m talking about. What’s easier to explain is when and why it started, and it has everything to do with a little acorn. You see when I was a wee nipper in the late 60’s and early 70’s we lived in the North Yorkshire Moors, spending weekends on the Cleveland coast, and that acorn had a habit of appearing wherever we went. Even before I was five years old, I remember wanting to follow it and see where it took me. And for those who remember the old Public Information adverts on TV in the 70’s, this one about the Cleveland Way was the clincher for me. It was sort of fated then that in the late 70’s when I was 12 years old, my mum did something which today could, ridiculously, have had her arrested for child neglect. She dropped a school friend and I off at Helmsley with £20, rucksacks, tent and sleeping bags, and left us to walk the 105 miles of the Cleveland Way around the moors and coast to Filey…alone. Somebody would be there to meet us in 7 days. And I can only thank her for the responsibility and independence that she installed in me at a young age by trusting me. So weighed down by a Cobmaster framed rucksack bigger than I was, and armed with a wildly out of date Bartholamews half inch cloth map of Clevelend, the two of us did just that. Living the life, eating ice cream, and sleeping wild wherever the days ended. It was pure adventure for a couple of 12 year olds, and after that I just wanted more. Under-aged backpackers sporting ridiculously large packs. Over the next couple of years the young crack partnership ticked off other trails , sometimes under canvas but often adopting an ultra light ethos, packing only our rectangular polyester sleeping bags and big orange plastic bags. I have chilly memories of backpacking the Dales Way during a February school holiday, having to defrost the tent zip each morning to get out. That trip was so darned cold, I felt like Scott of the Antarctic. But those ridiculous rucksacks were holding us back. The top half seemed to tower above your head, and your bed-roll strapped beneath would bang against the back of your thighs as you walked. We dreamt of having padded hipbelts and retaining some sort of normal centre of gravity. 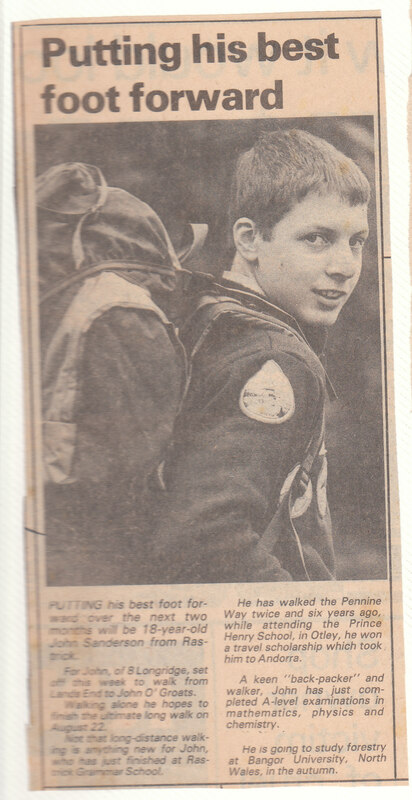 So in 1983 at the age of 16, hard earned pocket money (actually my dinner money which had been secretly squirrelled away each week) was invested in Berghaus Cyclops Roc rucksacks and my pride and joy…a Phoenix Phreedome tent. We were now mixing with seasoned professionals ! Credible gear called for a credible backpacking route so that summer after our O-level exams, we spent a little over two weeks bogtrotting the Pennine Way. 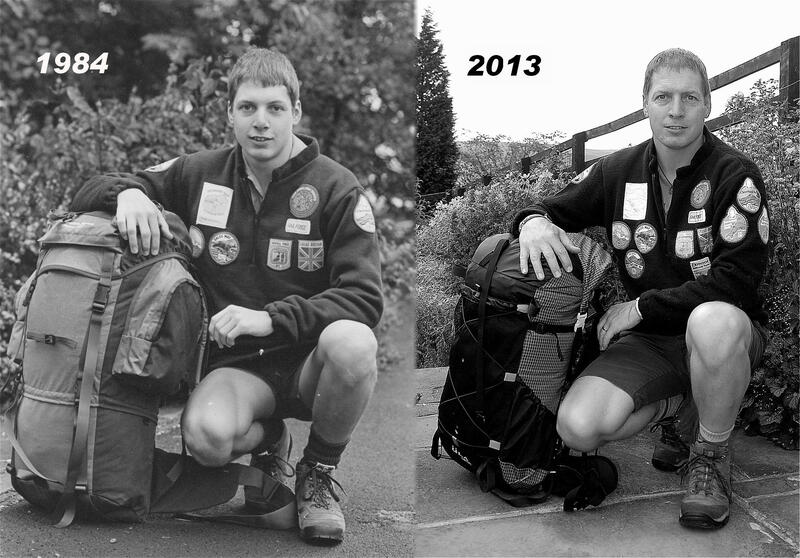 I’d like to think that we’d started to cut the pack load, but the rucksacks still tipped the scales at 44 lbs (20 kg). The second day of any trek back then was always agony, nursing the pack onto badly bruised shoulders and hips, and it wasn’t until the second week that the inevitable blisters stopped bleeding. You didn’t just wear your boots in, you had to wear yourself in. 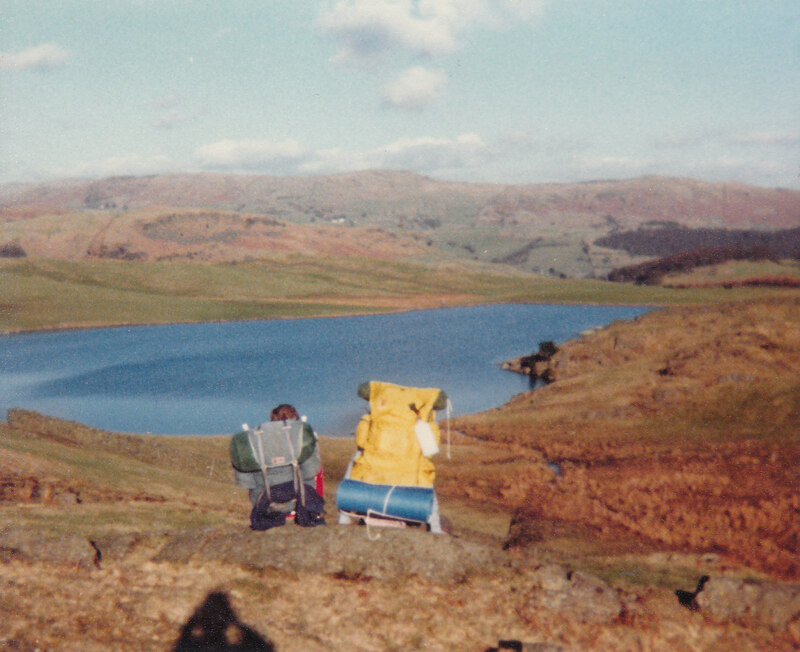 Sadly after one last trek a few months later, Wainwrights Coast to Coast, the childhood trauma of moving house and changing school ended that early backpacking partnership. I do remember though saying to my friend in a fit of bravado during that last trip that one day I’d backpack LEJOG, from Lands End to John O’Groats. A dangerous seed to sow, but heck I had a lifetime ahead to get it done. That was why slightly less than a lifetime later, in fact in 1985 when I was 18 years old, I found myself on a train to Penzance with the crazy notion of backpacking solo from Lands End to John O’Groats with a little over £150 in my pocket. For the next 8 weeks I walked over 30 miles a day, drank copious amounts of pop, and ate mars bars until I couldn’t stand the sight of them. And each night I slid like a worm into the smallest tent known to man and slept. I followed the hills whenever I could, camped wild and got a suntan that to this day I’ve not been able to match. By the time I reached John O’Groats I’d backpacked 1,350 miles and spent 50 nights cocooned like a chrysalis. I’d also seen more of the country I live in than I guess many of my friends would see in their lifetime, and I’ve been grateful ever since that I had the stupidity to do it young; it gave me a real appreciation early in life for the country I live in. The 30 years since then seem to have raced by so fast. I went to university, lived in Finland for a while, got married, rock climbed and mountaineered around the World, and backpacked trails from Cape Wrath to Cape Horn. And a rucksack and tent has accompanied me all the way. I’d be the first to admit though that for a while from my mid thirties, career seemed to take up too much of lifes energy. I continued to backpack, but my mind was still at work. Then last year, by now in my late 40’s, I scraped through yet another impending redundancy and realised that nothing in life is certain, except the things we know bring us pleasure. That’s when I discovered I still had a badge emblasoned fleece that I’d worn on my LEJOG walk. Life back then life, like backpacking, seemed so simple. I wonder ! Still fits…and still cringingly unfashionable. Maybe it takes half a lifetime to really appreciate the things that energise us, rather than tire us. Maybe it really is as simple as this. So I walk. Thanks David. I’m enjoying reading your blog, more entertaining than anything on the TV. Laugh out loud funny. Thank you, I’m really glad you like it. I really started it last year for the TGO Challenge but I’m enjoying keeping a record of what I get up to throughout the year.